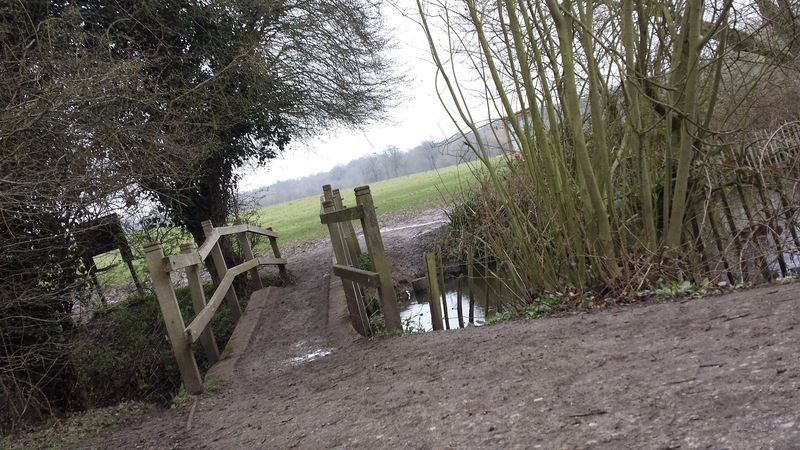 The origins of Weald Country Park lie in the stunning grounds of Weald Hall, which had parts dating back to the 16th century. Originally forest land, and subsequently a (fallow) deer park used for hunting, the area was beautifully landscaped for Hugh Smith who was Lord of the Manor between 1732 and 1745. Over time, the estate grew and further areas of adjacent land were enclosed - by 1841 the estate grounds covered a whopping 800 acres. After this time, the estate's steady decline started. It was let to farmers in the late 19th century and then sold in 1946 when the land was broken up - a signiifcant chunk of the land was retained to be part of London's green belt. Weald Hall suffered damage during the war which lead to its demolition in 1950-51. 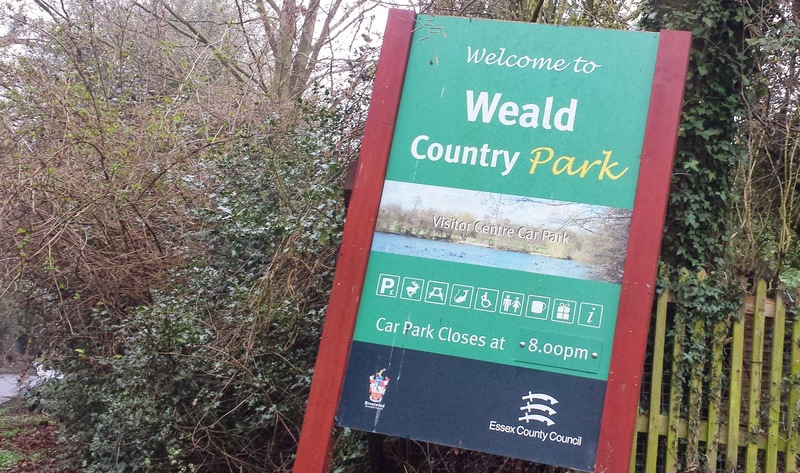 The country park, which covers a mere 500 acres, retains its 18th century landscaping complete with tree-lined avenues and lakes. 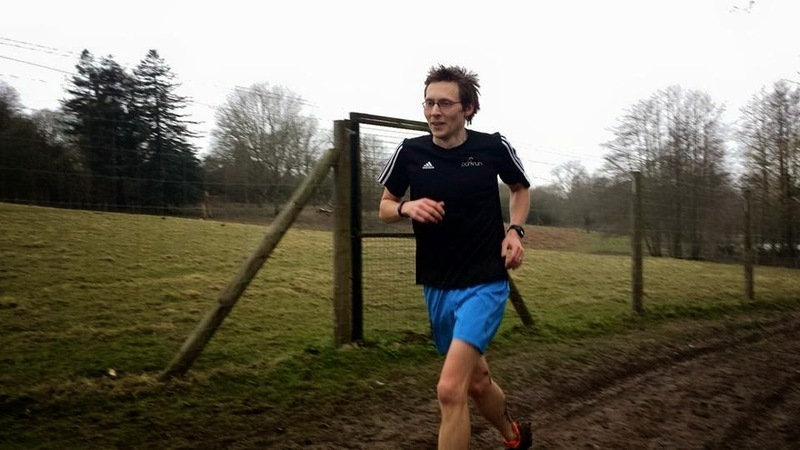 It became home to Brentwood parkrun on 6 December 2014. 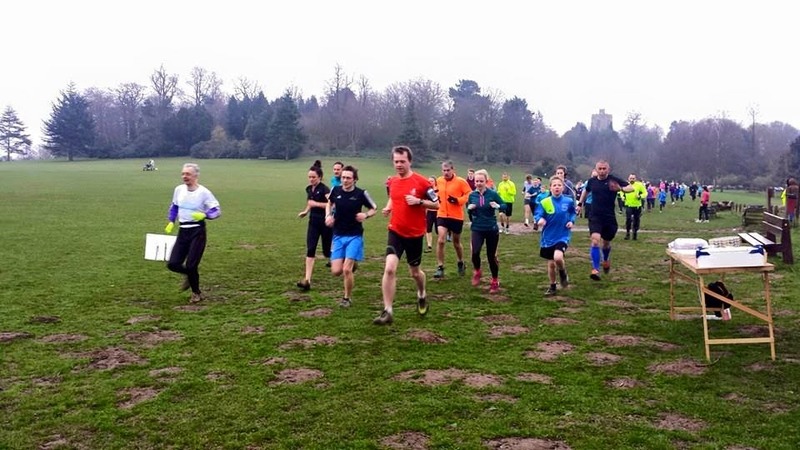 I had heard great things about this venue during its first few weeks of operation from fellow parkrun tourists and I finally managed to head into Essex with an entourage of 10 regular Dartford parkrun runners and volunteers to take part in Brentwood parkrun event 18. 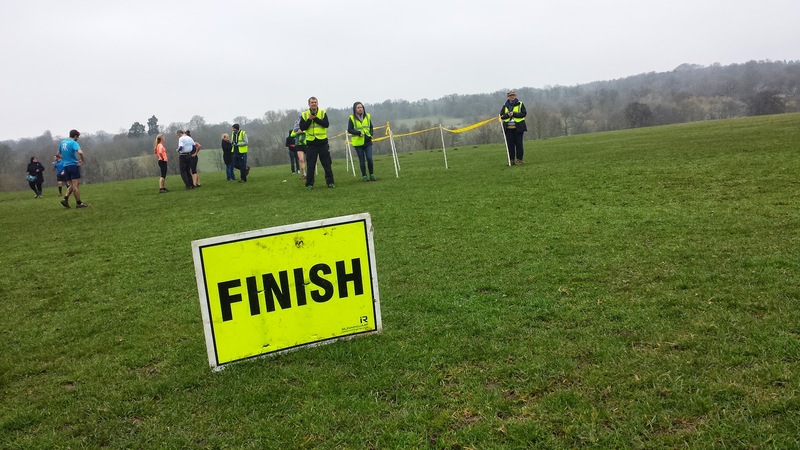 Our ED had been forced to cancel our own event because an Easter Egg Hunt was scheduled to take place and their set-up meant that they'd have vehicles moving around our course mid-run, which simply left no other choice. The first thing I noticed upon arrival is that the start-finish field is very exposed to the weather and it felt much colder than the forecast had suggested. The facilities here are good - there are four car parks to choose from for which parking fees are payable. As of April 2015 they are; up to 30 mins is £1, up to 1 hour is £1.50, up to 2 hours is £2.50, up to 3 hours is £3.50 or over 3 hours is £4. As we were planning to hang around for a while after the run, I stuck £4 in the machine. I then got changed into my trail shoes. Interestingly, the Belvedere car park uses the site where Weald Hall previously stood and you can find some interesting historic features here. Most notably some brick steps which are still intact and lead up to the remains of the Belvedere (meaning 'fair view' or 'panoramic viewpoint' in Italian) Temple, which was built in the 1740s as a folly from which the estate could be viewed. For anyone travelling by other means, there is a train station in Brentwood town centre which is approximately 3.5 kilometres away from the start line. Cyclists should head to the visitor centre car park where they will find a cycle rack on the right hand side just past the cafe. I hear there are buses that pass the venue but the bus stops are on the opposite side of the park and a 1 mile walk (or warm-up jog) is required to get to the start line. There are a number of toilet facilities dotted around the park - the ones adjacent to Belvedere car park (on the map but not visited by me) are the most conveniently placed for the start of the run and the visitor centre best at the end. The run takes place over a single, undulating, figure-of-eight shaped course. 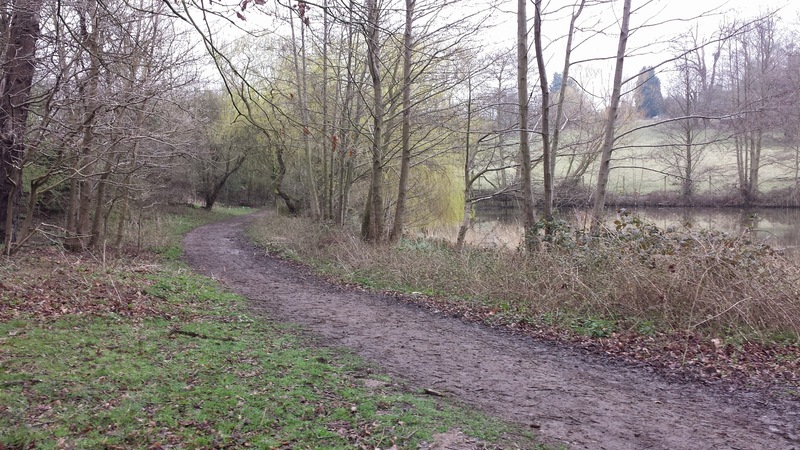 Please note that this is the course as of April 2015 - I have read on the event news page that course alterations may be forthcoming so please check the venue's news and course pages for the latest information. The figure of eight is completed by running an anti-clockwise upper portion and a clockwise lower portion. Underfoot you will find a combination of grass, forest paths, dirt and mud (hence the trail shoes). 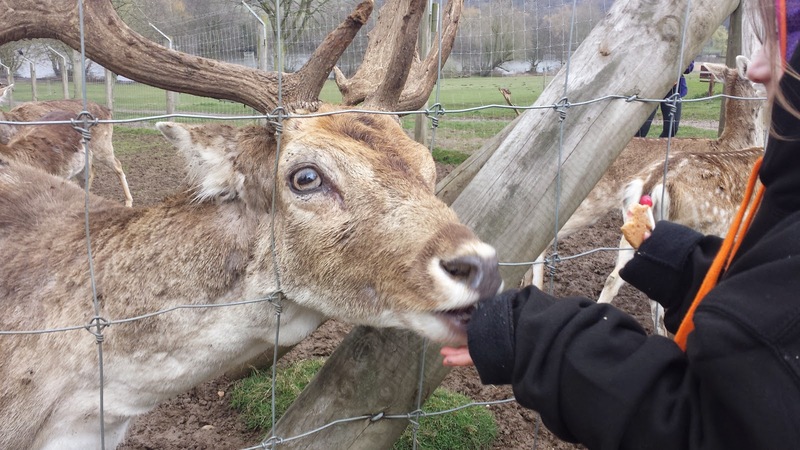 The fallow deer have been re-introduced into the park, but instead of roaming free they are kept in an enclosure which the runners pass shortly after setting off on their 5 kilometre dash around the former country estate. The opening section of the run on Belvedere Field sees the runners head down a progressively steeper downhill section through open grassland leading towards the park's lakes (some runners took the option of the firm path instead of staying on the grass). After passing between the lakes, crossing a narrow hump-backed bridge and entering Lake Field on the northern side of the park, the runners then head uphill for a bit before the course briefly flattens out. The grass is pretty lumpy underfoot here (possibly molehills) so care is required to avoid twisting an ankle. A sharp left-hander at the most easterly point of the course takes the runners into the woods and onto quite a firm path which signals the start of the longest continuous uphill section of the run. This uphill lasts for just under a kilometre and brings the runners out at the highest point of the course. If you're feeling a little puffed out at this point it is worth noting that this park was originally earmarked as the venue for the London 2012 Olympic mountain biking event but was rejected by the International Cycling Union for be 'insufficiently challenging'. The course flattens out and then starts to head generally (but not exclusively) downhill from this point. 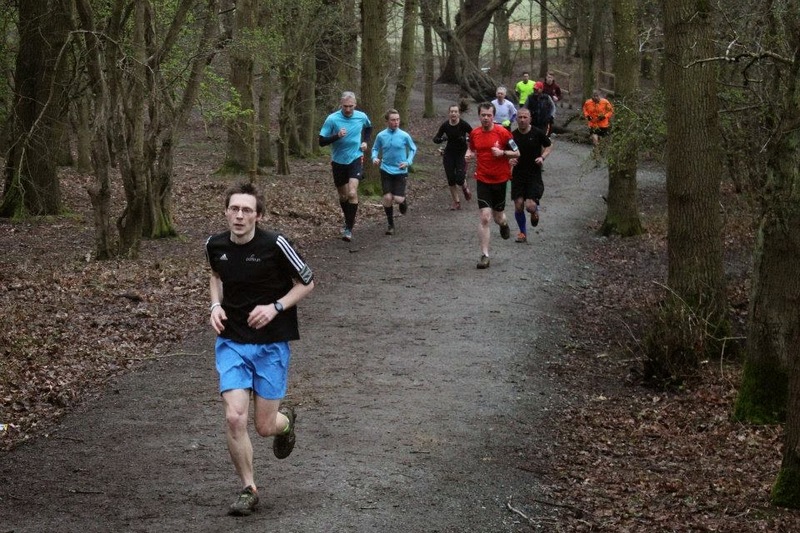 At first the runners remain mostly in woodland, but shortly after crossing the course's second bridge they soon find themselves back out in the open. They continue downhill until they reach the strip of land between the lakes again. 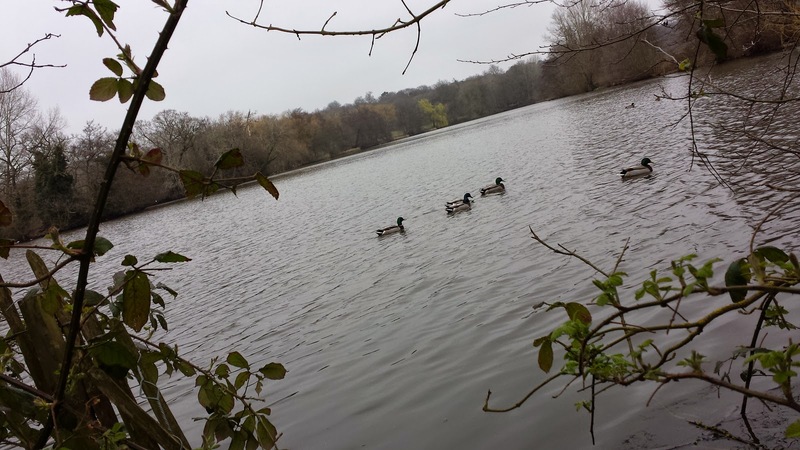 They cross back onto the southern side of the lake using a different path this time (this one was very muddy when I visited) and in doing so have completed the large anti-clockwise circle that forms the upper portion of the figure of eight. The remaining 1.5 kilometres are made up of a three-quarter clockwise lap of Belvedere Field which features more (insufficiently challenging!) climbing before the runners pass the original start point and head downhill towards the finish line which is adjacent to the visitor centre car park and the deer enclosure. With all that done a breather is definitely required before having your barcode scanned (results). 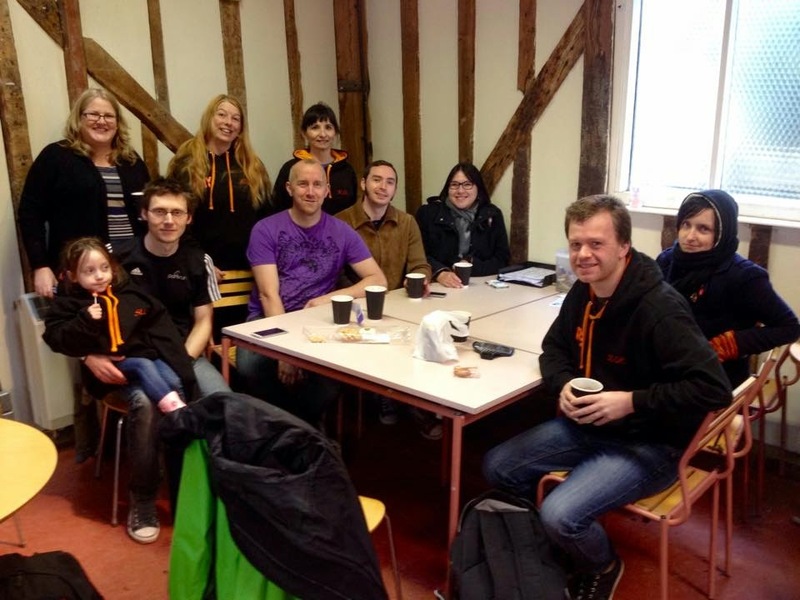 The Brentwood parkrun experience would not be complete without a visit to the cafe for a well-earned beverage! It's definitely worth hanging around for a little longer and exploring the park. 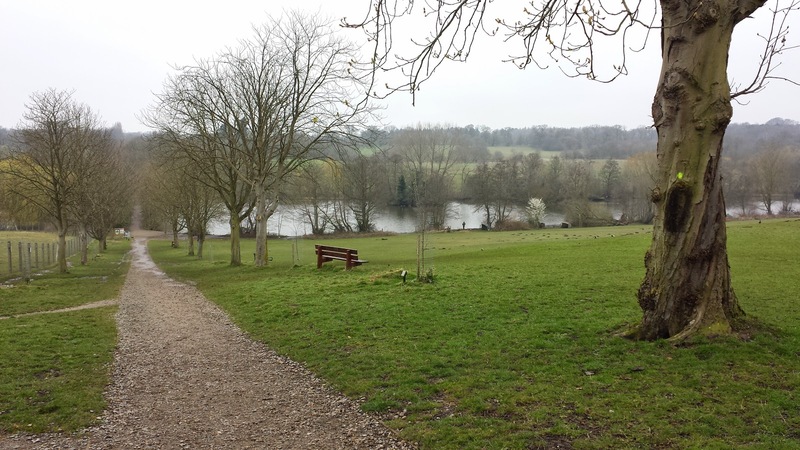 Head up to the Belvedere Temple to check out the view, feed the deer (and ducks), find the iron age fort, go to the bird hide to see what wildlife you can spot or just go and explore even more of the park on foot. 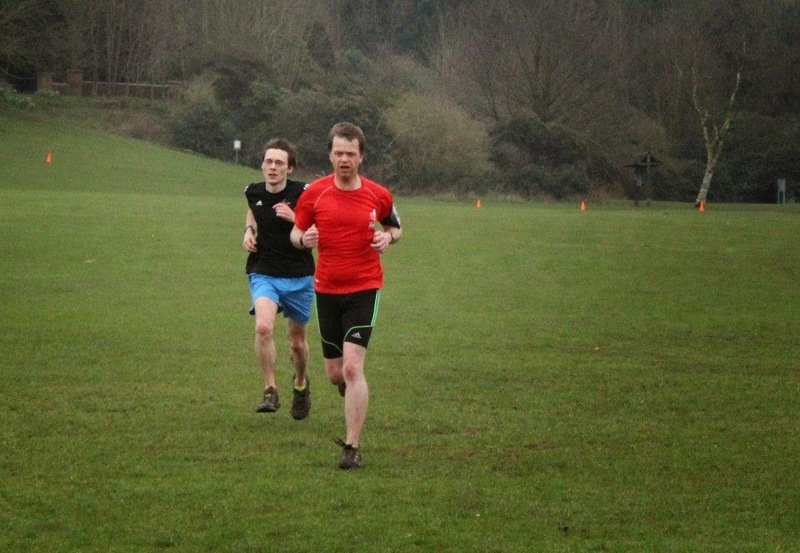 In the wetter months, this parkrun is in proper trail / cross-country territory and you can see just how tough a course it is by looking at the fastest 500 list - As of event 18 only 11 individuals out of a grand total of 582 have managed to run under 20 minutes here. For anyone interested in viewing the course profile, here is the link to my Strava GPS data. Other than that, it's a great course and another fine addition to the impressive set of venues in the Essex region.